I look forward to your guide. Currently referencing the current drop of it on my own RPG setting game. I have all the text written, but I seem to be procrastinating about formatting it. Hi Mark - I am glad the organisation guide is handy still. The new guide will incorporate it and go much, much further. I'm curious, is there any difference between a for-profit game and free game? Other than the illustrations and typesetting, I mean. 1. I have no idea how to write a commercial RPG because I've never done it. I've always been more devoted to creating things than to talking about them. It's -as usual- for free and does not require any plug-ins. I hope to see soon the new version of Icar. Meanwhile, I'm also starting to do a free science fiction RPG. "You want to write a game about Ninja Donkeys solving the world economic downturn - no problem!" sorry wondering off topic. Good to see you back old chap. I hope to hit a creative "streak" this summer, during my temporary reprieve from academia. ICAR will be your Magnum Opus. Nevermind those theses on cybernetics, artificial intelligence and soil science. 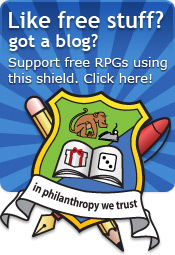 In addition to the mighty ICAR, your guide to RPG creation will be a hit i'm sure!